Due to demand, KARBONHEX is now available in standard bulk packaging and now retail ready to maximise sales potential. Two retail options are currently available, either bulk or counter top display box point of sale. 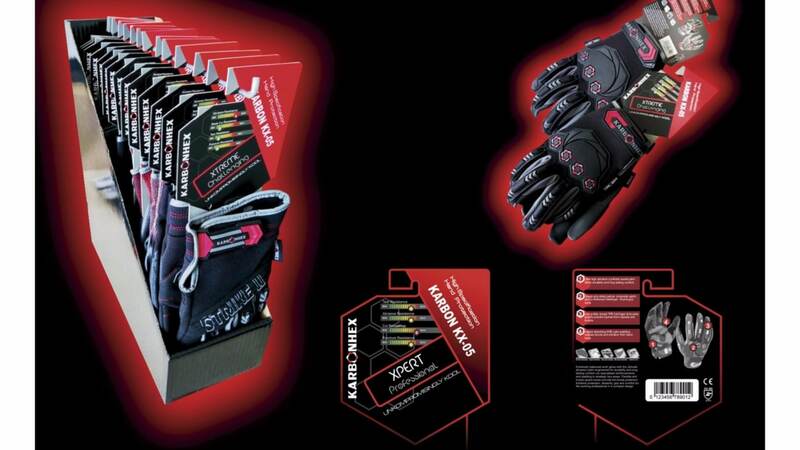 Both come complete with a unique eye catching slotted header card with our prominent bar level indicator guide on the front and four key product features clearly detailed on the rear to make glove selection simple yet informative. All gloves are specially carded in a way that conveniently allows customers to try on the gloves for sizing, feel, flexibility and dexterity. Founded in 1991 and headquartered in Shanghai, China, we provide many products and services in the industrial hand protection sector. However, due to the success of KARBONHEX gloves and client request, we are now expanding the range to cover a select and innovative range of P.P.E. The striking goods looks, high specification and quality, the essential attributes of the Karbonhex DNA will be implemented into a unique and bespoke range of head to toe personal protective equipment.